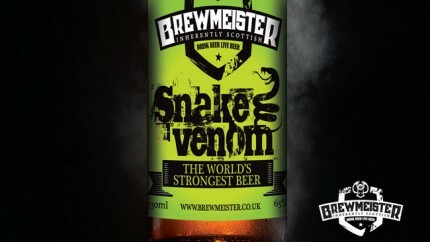 At a whopping 67.5% alcohol by volume, aptly-named Scottish beer Snake Venom is currently the strongest beer in the world. Banchory-based brewery Brewmeister has taken the title of strongest beer in the world from previous record-holder ABV Armageddon (also by Brewmeister), which is 65% alcohol by volume. In comparison, your typical bottle of vodka is usually only around 40% alcohol. The Brewmeister website says that while the alcohol is strong, “the beer still tastes like a beer rather than a spirit. It’s hoppy, malty and very pleasant”. However, not only does Snake Venom come with a warning label advising punters not to drink more than 35ml in one sitting but it comes with a pretty hefty price tag, too. One 275ml bottle of Snake Venom costs about $80 US – and that doesn’t include shipping. Brewers Lewis Shand and John McKenzie told Scotland’s Daily Record that it should be poured like a whisky. “There are too many bland beers out there and we are trying to push the limits. It’s still a beer, but it’s something different,” they said. They managed to increase the alcohol content of the beer by freezing the mixture several times during the fermentation process.